Chicken Pot Pie is one of those foods I love but don’t eat very often. For starters, I’m just not talented enough in the kitchen to make a good chicken pot pie. Also, it can be fattening. And lastly, I just didn’t really know of a good brand or place to buy a pot pie. To be honest, it’s not often that I buy a “frozen meal.” But I have to say – this Chicken Pot Pie from Marie Callender’s is delicious. There was not a morsel left and hubby and I were fighting over the last few bites. And being even more brutally truthful, I have to tell you all, I MICROWAVED this meal. I had planned on cooking it but we were running late with an afternoon of errands and soccer practice. I had about 30 minutes to get a meal together, get the kids fed and in the bath. 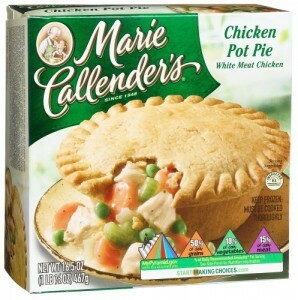 The Marie Callender Chicken Pot Pies were listed by Yahoo! Shopping in an article titled 8 Grocery Store Products that are Better than Homemade (really). I received a coupon and compensation for this review from Marie Callender’s and TheMotherhood, however, as always, all opinions are my own. yum, yum- not even 8am and I am already mouth watering hungry for chicken pot pie. . . .
I’ve just put the chicken pot pie on my shopping list for tomorrow!!!! You’ve tempted me!!! !